I just received the photos of my finished ring from David so I wanted to share them here. There is also a video on his instagram but the file was to big for me to post it here. Stats are .87 k vs1 AVC in 14 k rose gold with .08 accent diamonds. sledge, goldenfire, Sparkle_ruckle and 29 others like this. 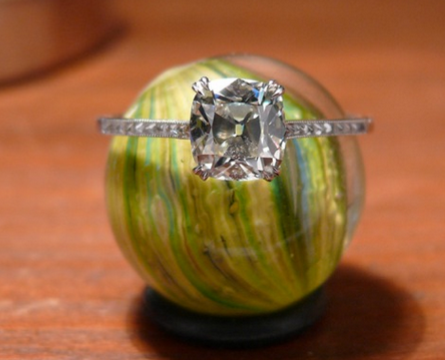 Your ring is absolutely stunning. Definitely pinterest worthy. Please post hand shots once you receive it. Beautiful and delicate looking. Would also love to see hand shots! Beautifully detailed! Gorgeous ring! Looking forward to hand shots. Gorgeous. Can't wait to see hand shots. Love it! I saw it on DKJ's instagram and thought it was a knockout! Oh wow!! That is gorgeous. I'm in love with rose gold and this setting and stone combination is stunning!! Thank you everyone. I will post some hand shots next week. It won’t be here until Monday so I am trying to be patient. I am having a hard time with that though. So beautiful! I saw your ring on IG today and thought that it was gorgeous! I saw your photos and said, "Oooooooh." This is such a lovely and romantic ring! I adore everything about it. Absolutely exquisite & such a work of art! Stunning stone and setting. I looooove the detailing on your ring. Great work by David! How did you come to this settting? Beautiful! Can't wait to see more photos once it arrives! I love this ring -- so romantic!! I had David combine parts of these two rings. Sparkle_ruckle, lorrissey, KristyDarling and 3 others like this. I am glad you all like it, I do think David did a beautiful job on it. Thanks. I got it in here, in case you weren't aware of this page. Just copy and paste them! Thanks so much! I always wondered where the "this thread is useless without pics" one came from! The martini one is killing me! !